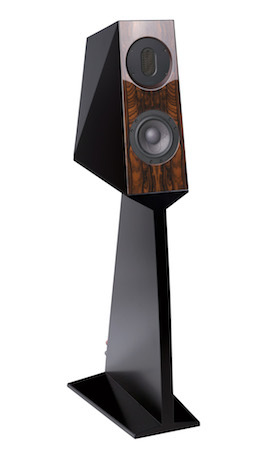 Close your eyes and you’ll think it’s a floor-stander – the scale, power and presence from this speaker is astonishing. Despite its compact size the Chiara is a technical tour de force. Keys to this performance are not apparent: a third drive unit on the back, the stiff, ultra-dense cabinet and the Vertex vibration absorbing treatment – three labyrinths built into the stand. “In a conventional design, dynamic intermodulation back into the driver motors would significantly smear the time domain, and RFI intermodulation with the complex signal would severely modify the tonal content of the output. The Chiara is doing substantial work when the music is in full flight, draining signal-related ‘real time’ energy down into the stand labyrinths from both the drivers and the crossover, and the EMI treatment is killing the signal/RFI intermodulation products too. That explanation tells you why most stand-mount speakers cannot cope when the going gets tough, loud and complex. But if the design is as clever as the Chiara’s there can be huge gains in precise imaging and accurate, uncoloured timbres of voices and instruments – big sound from a room-friendly speaker. Launched at the Munich HighEnd show it created a huge response and, in conjunction with the Kaiser room treatments, earned a ‘best sound at the show’ award from the Audio Beat Munich. 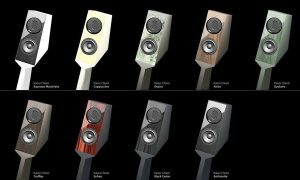 There are more enthusiastic reviews but here are HiFi Statement and HIFI+103 Chiara LR which also explain some of the remarkable manufacturing demands. Some examples of possible finishes, but anything can be specified to match colour schemes, furnishing style or personal taste.